← Standing in Your Light (Changes abound). I’m subbing a class on FRIDAY May 19th from 12-1pm at Durham Yoga Company. This one hour class is the perfect potent combo – 40 mins Fast and Furious + 20 mins Sweet and Slow. Join me! Tomorrow class is on as usual, 10:30-12pm also at Durham Yoga Company. Next week I will teach Wednesday 5/24 as usual, 5:45 – 7:05 at Health Associates. Saturday, 5/27, I will have a sub for Align and Shine. 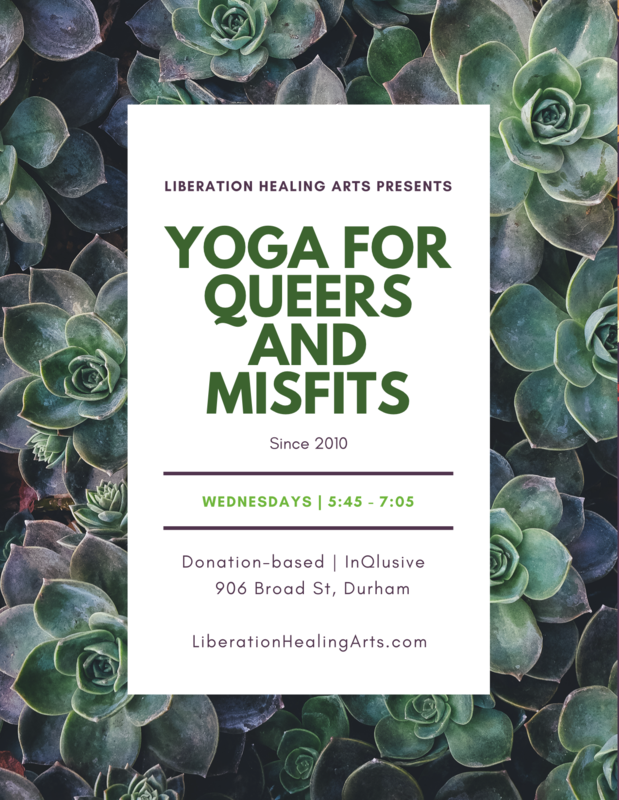 This entry was posted in Uncategorized and tagged body positive yoga durham, community-care, durham yoga, durham yoga company, inclusive yoga, live your yoga, queer yoga, queer yoga in durham, trauma healing, yoga. Bookmark the permalink.